Kits make hazardous material spill cleanup quick and effortless. 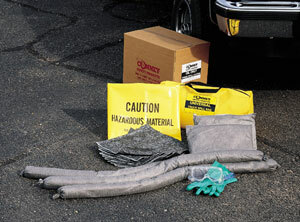 Easily stored in most vehicles and includes enough sorbents to contain up to a 7 gallon spill. Your choice of Universal Kit for aggressive/non-aggressive fluids or Oil-Only Kit for petroleum spills. Kits are available in either a water-resistant nylon duffel bag or a totally disposable carton.